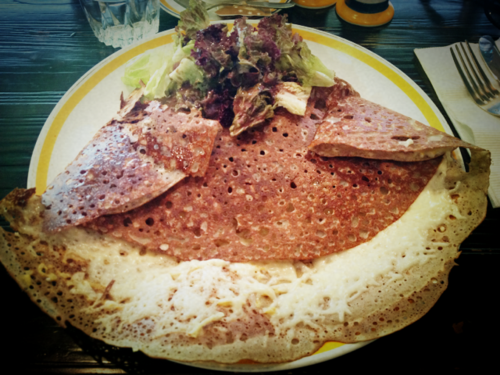 If you are a fan of French crêpes, here is a restaurant for you! Situated on the second floor of a building in Wan Chai between Hopewell Centre and Star Street, La Crêperie is a cosy, dignified French establishment that is easily accessible and neatly seats around 20 persons. High wooden tables, lighthouses on the tableware and paintings of the sea on the wall pay homage to the shores of Brittany, and these are even matched by the waiters’ and waitresses’ blue-and-white-striped uniform. La Crêperie also has a branch in Shanghai. Whenever we go to La Crêperie, we notice that there is always one or two decent-looking French men at the restaurant. One of them is the owner of the restaurant and he is always extremely helpful and attentive. However, the other waiters and waitresses are polite but rather laid-back, and can be slow in responding to requests. The crêpe selection at La Crêperie is an utter delight. The menu is filled with French names and can be confusing for someone who doesn’t speak French, but the selection includes classics as well as more inventive items, and I am always enthralled with the task of picking something from the mouthwatering descriptions. There are also pastas, mussels and other rustic French dishes. 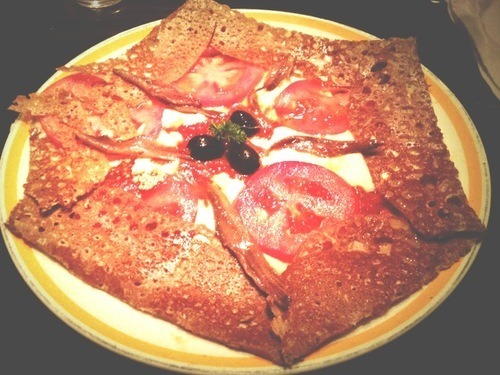 Even though I have never tried them myself, my friends who have tried told me that they are not great, and I always find myself too attracted to the crêpes to want to eat anything else anyway. In terms of pricing, I read on Openrice that some people find the crêpes overpriced, but for such fantastic meals which always only come to around $200 per head, I do not find the bills expensive. 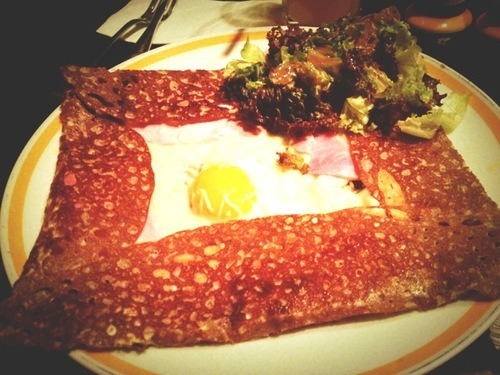 Anyone would tell you that one of the most classic crêpes you can get is La Complete ($68), which is an open crêpe with ham, Emmental cheese and egg. 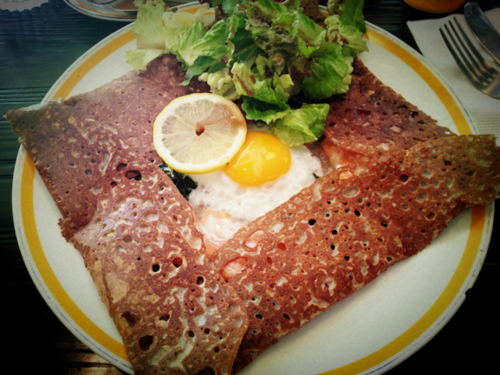 The savoury crêpes are made with buckwheat flour as opposed to plain four, and the crêpes here are all heartily chewy. The layer of Emmental cheese was thick and satisfying, and the sunny side up was done beautifully. If you are in the mood for salmon, definitely go for La Piano ($106), which has salmon and spinach cooked in cream as its filling. The salmon was skilfully coated in a suitable layer of cream, and the spinach added a fresh, crunchy note to the smooth fillings of the crêpe. I also loved how this crêpe was decadent but not too oily, but my complaint was that it was too salty overall. Talking about saltiness, this L’Italienne ($108) received a rather low score on my scale. Looking at its description on the menu, it comprised of all my favourite ingredients – tomato, mozzarella & Emmental cheese, anchovy and olive, but these ingredients didn’t come together nicely at all. As all the crêpes were made-to-order, this crêpe was gorgeously warm and crunchy when it was served. However, perhaps the restaurant took the Italian theme of the crêpe too seriously, to the extent that the crêpe resembled a pizza, with thick sauces and heavy flavours that I did not expect from a crêpe. Most importantly, this crêpe was way too salty, with savoury seasoning from the tomato sauce and more saltiness from the anchovy. Indeed, it was my fault for ordering this; next time if I felt like tomato and mozzarella, I should go get a pizza instead. Next, we had La Rennaise ($75), which had sausage cooked in Dijon Mustard and Emmental Cheese as its filling, and was served with a salad on the side. The pork sausage was meaty and delectable, the Dijon mustard gave this crêpe a punchy flavour, and the Emmental Cheese was half melted, just the way I wanted it to be, making this a truly pleasurable dish for me. While all the savoury crêpes at La Crêperie were too salty, La Rennaise surprisingly did not have this problem! I really do not know how we managed to fit so many crêpes in our stomach, but there always seemed to be room for dessert crêpes. One “childish” crêpe we adore is Le Pecheur ($68)(top) , which is a sweet crêpe with chocolate, banana, grilled almonds and whipped cream. With fantastic banana chunks, gorgeously thin and crunchy almond flakes and a thick, heavenly chocolate sauce, this dessert had an amazing taste and was truly cream-tastic! 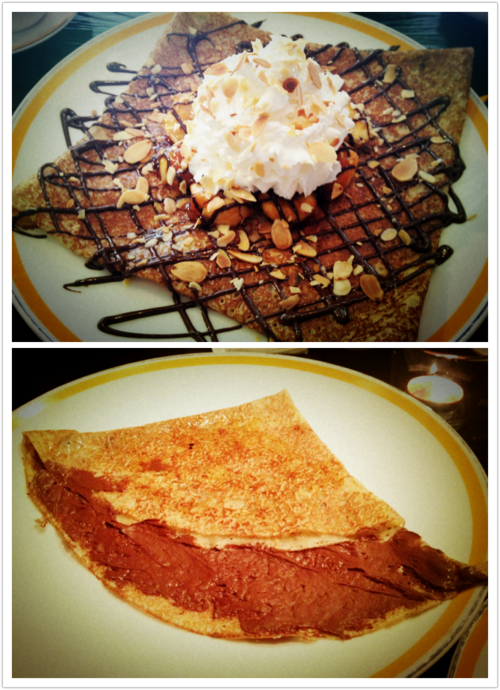 Another classic is Nutella Crêpe ($45)(bottom), which is approachable but not simplistic, and never fails to cheer us up. When served with a large scope of vanilla ice cream, this dessert brought back the best of our childhood memories. Even though the crêpe could get a bit heavy and sticky in the mouth, who could dislike Nutella? 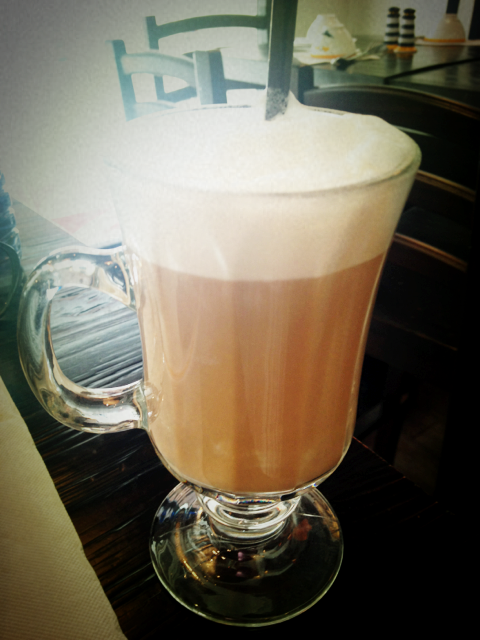 After all the creamy, chocolatey goodness, we just had to wash it down with a Cafe au lait ($38). Frothy, aromatic and not too bitter, this is definitely something for you to pick up before you leave the restaurant. Conclusion: Even though some of the savoury crêpes are too salty, the dessert crêpes are reasons enough to bring me back to the restaurant. Moreover, my friends and I absolutely adore the cosiness of this homely establishment!